The new 35-story, 807,000 sq. 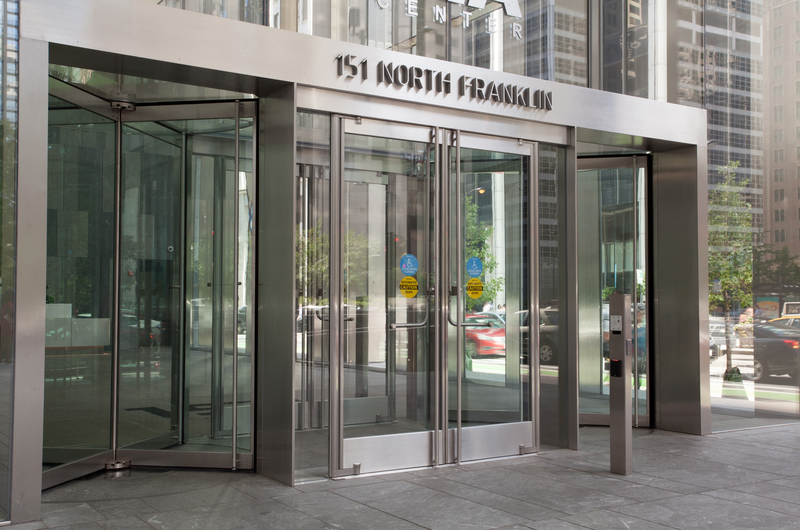 ft. office building at 151 North Franklin — also known as CNA Center — in Chicago, IL, features two pairs of narrow stile custom balanced doors by Ellison Bronze. 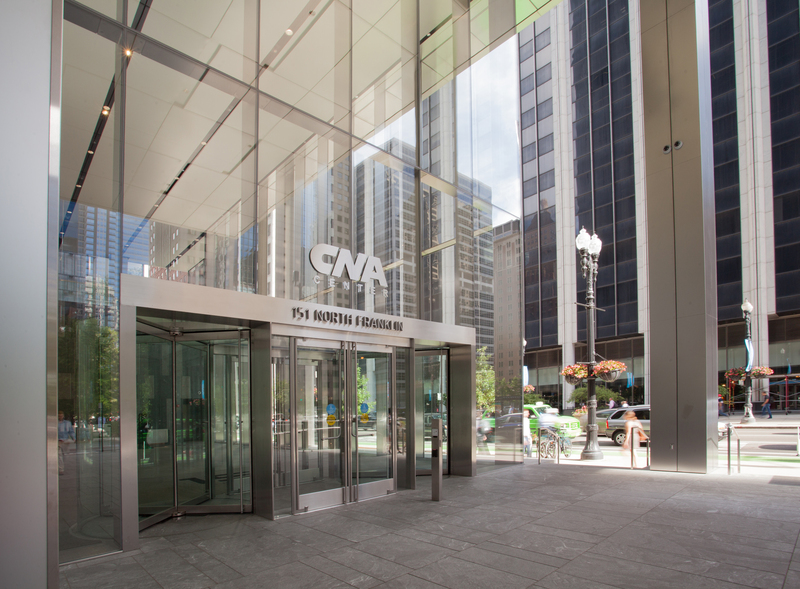 151 North Franklin’s anchor tenants include CNA, the eight largest commercial insurer in the US; and Hinshaw & Culbertson, ranked in the top 100 largest law firms in the country. On the northeast corner of Franklin and Rudolph, located in Chicago’s “Loop” financial district, 151 North Franklin joins a host of other high-profile facilities across the city that feature Ellison entrances. The Loop is Chicago’s central business district, 1.58 sq. mi. of commercial real estate with more than 300,000 workers from a variety of business sectors. It is the second largest central business district in the US, only after New York City’s Midtown Manhattan. 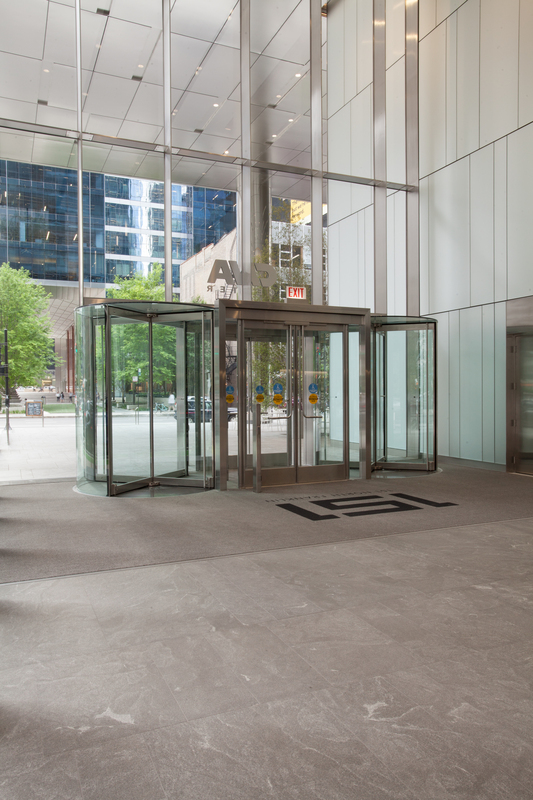 At 151 North Franklin, the stainless steel Ellison doors are finished in fine satin, completing the sleek all-glass and steel entrance. The entrance vestibule consists of revolving doors at each side of the balanced doors creating a cohesive and elegant design. The narrow stile and tempered glass door leaves have 4-3/4”-high top rails, 10”-high bottom rails, and 1-5/32”-wide stiles, and were factory glazed with 3/4”-thick low-iron, heat-soaked, tempered glass. Ellison narrow stile balanced doors feature thin decorative stile edges compared to the traditional tempered glass doors. Narrow stile doors enhance entryways with clean lines that support large expanses of glass, delivering a polished aesthetic. 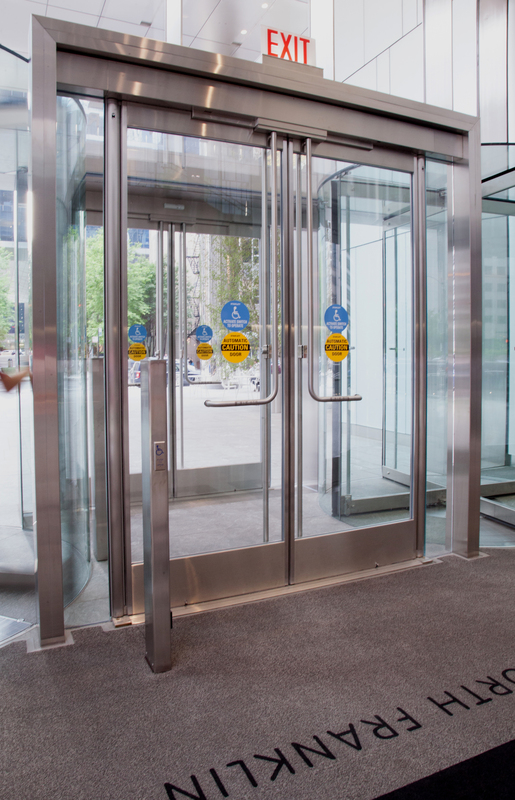 The Ellison doors welcome pedestrians to a spacious, well-lit lobby and second floor mezzanine before they proceed to their individual workspaces. During the morning rush and afternoon departure, heavy foot traffic flows smoothly – a result of the minimal force needed to open a balanced door, and the inset pivot reducing sidewalk encroachment by 33%. Floor-to-ceiling glass windows, aided by the generous 10-foot ceilings, optimize daylight throughout the interior offices and areas of collaboration. In addition to reducing HVAC costs, the natural light provides a more satisfying and productive work environment. The building was designed for maximum efficiency with open, column-free lease plans and column-less corners. 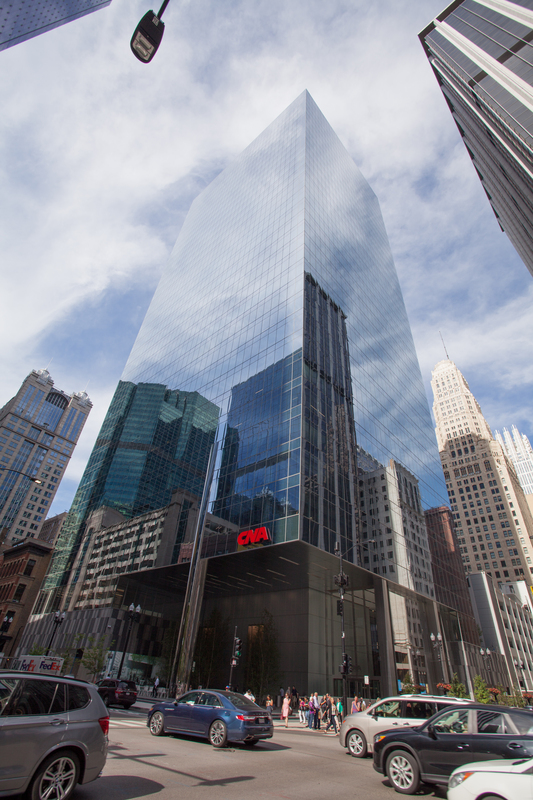 CNA Center also features a demand-based HVAC system for enhanced tenant control and lower operating costs, plus a supplemental solar panel energy system installed on the rooftop. 151 North Franklin is LEED Gold® certified and WiredScore Platinum pre-certified. The building utilizes the latest technology to support connectivity through dependable cellular and Wi-Fi coverage from the basement to the 35th floor. The building is topped off with a rooftop sky garden – a tenant-only lounge that provides the ideal space for daytime breaks or private events. 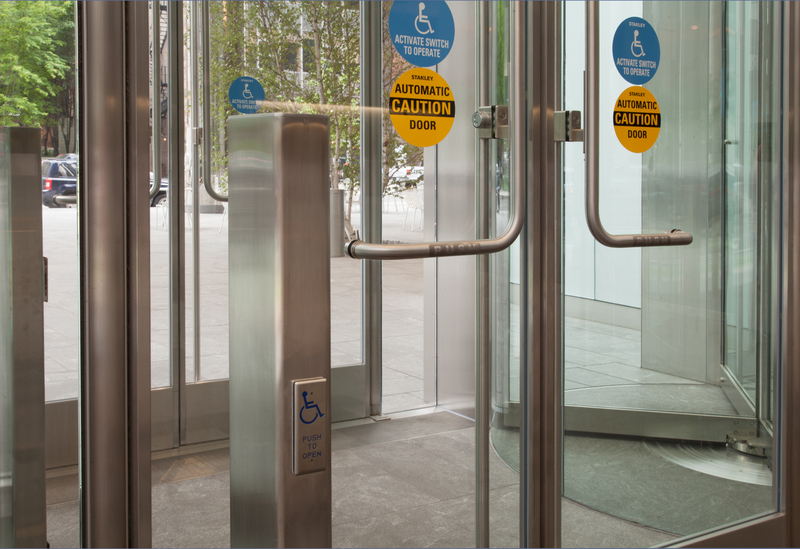 The Ellison PowerNow®-equipped entrances feature Stanley® Magic-Force™ low-energy concealed overhead power operators – complying with the latest ADA Standards and enabling access for all users. 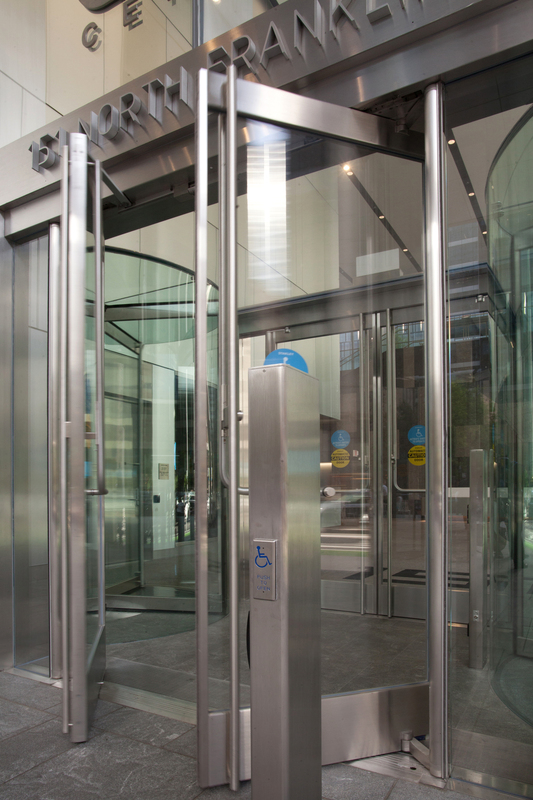 PowerNow doors feature an actuating arm for on-demand opening. Ellison balanced doors are designed with precision and outperform any other in the industry. Doors and frames are formed and welded using sheet material giving the doors a rigid, unitized structure that withstands the test of time. Ellison also provides detailed record keeping and full warranties – important when considering the extensive lifespan of an Ellison door. Every door made is imprinted with an individual project number to facilitate easy tracking and maintenance. Furthermore, all Ellison balanced hardware components are machined in-house, which means that replacement components are always readily available. Quality control and performance are paramount at Ellison Bronze which is why each door — including all balance hardware mechanisms — are cast, crafted, formed, and uniquely construction in-house from the finest choice of materials at Ellison’s ISO 9001-certified facility in Falconer, NY. 151 North Franklin’s amenities include a landscaped second floor terrace, high-end restaurant, casual cafe, fitness center, multi-purpose conference and event space, and executive in-building parking and bike room. 151 North Franklin was completed in spring 2018. The project team included glazing contractor Crown Corr, Inc., Gary, IN, and Ellison representative Hadley Associates Inc., Northfield, IL.